Peracetic Acid 5% is an indispensable part of any surface disinfectant formulation. It is applied on precleaned surfaces such as equipments, pipelines, tanks, vats, fillers, evaporators, pasteurizers and aseptic equipment in dairies, breweries, wineries, beverage and food processing/packaging plants, egg processing/packaging equipment surfaces, and eating establishments. More specifically, in Food and Beverage industry, our Peracetic Acid 5% meets all the necessary regulations such as high efficacy, low toxicity towards humans and animals, and environmental compatibility. 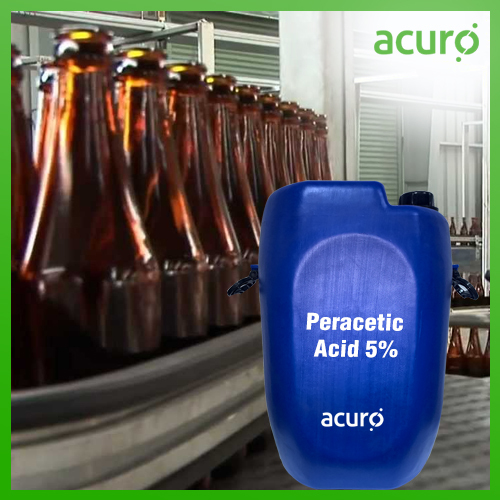 Acuro Organics Limited manufactures Peracetic acid 5%, a superior disinfectant used in multiple major applications.